Clockwise (L-R) GM Hichem Hamdouchi (Morocco), IM Amon Simutowe (Zambia), IM Ahmed Adly (Egypt) and IM-elect Kenny Solomon (South Africa). 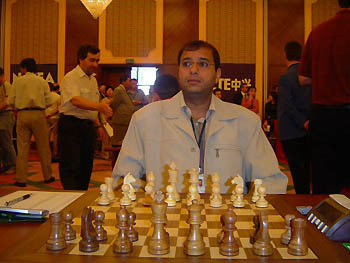 The 2004 FIDE World Knockout Championship was a historic event for many reasons. 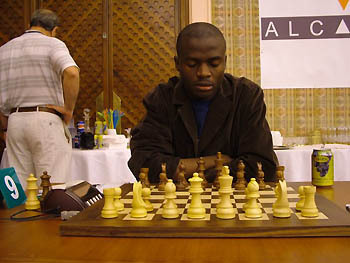 First, it is the next step toward unification; secondly, the tournament featured players from a wider variety of nations; lastly, it was the first chess championship held on African soil. Despite having lost the bid on the 2010 World Cup, Libya played host to 128 players from around the world in quest of title unification. Africa had a total of nine players (six qualifiers and three from host Libya). 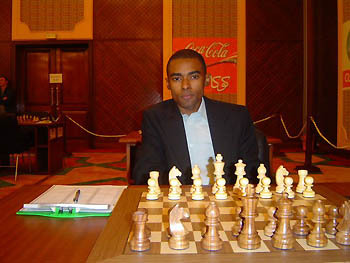 Africa's highest-rated player was Grandmaster Hichem Hamdouchi from Morocco, a veteran of top-level tournaments. Current African Champion, IM Essam El-Gindy of Egypt was there along with his compatriot, IM Ahmed Adly, Africa's strongest junior. Algeria's Arab Adlane, Morocco's Mohammad Tissir and Libyans, Hussien Asabri, Abobker Elarbi and Tarik Abulhul concluded the list of players from Saharan Africa. Hamdouchi made history by making it to the 3rd round after upsetting Alexander Motylev and beating Sergey Kudrin before losing to Michael Adams. Hamdouchi has been in the professional circuit for many years, but is recovering from a spate of poor results. This tournament showed his fighting spirit and was especially apparent in his games against Kudrin. In the clinching game, Hamdouchi got a good position out of the c3-Sicilian and in the diagrammed position he played 20.d5! threatening 21.d6. After 20…Nxd5 21.Bxd5 Rad8, the Moroccan played 22.Nxe6 fxe6 23.Rxf8+ Bxf8 24.Bxe6+! winning. He would lose to Adams, but showed tremendous fighting spirit. The "Zambezi Shark" and "King Solomon"
IM Amon Simutowe of Zambia was making his 3rd trip to this tournament and IM-elect Kenny Solomon of South Africa was making his debut. Both are tough fighters and represent some of the most promising talent on the continent. He was surprised that GM Nigel Short questioned him about his FIDE rating which has languished after reaching 2470. Simutowe remarked that he may not have realized that other players were noting his progress and perhaps he now feels that he should do better. He is searching for a focused strategy to improve and is searching for a trainer for a brief period to spot his weaknesses. 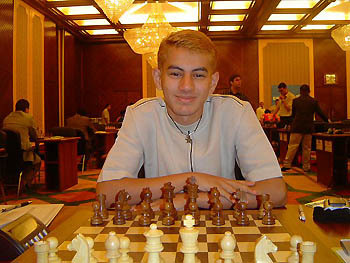 In the 1st round, he played Ivan Sokolov and was able to get the advantage in the latter stages of the game. 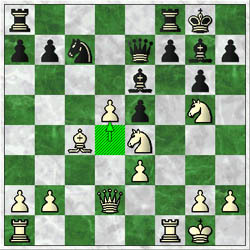 In a diagrammed position, Sokolov has just played 42.Bxd5 after which Simutowe played 42…Rc1+ 43.Rxc1 Qxb8 with an advantage. Simutowe later stated that 42…Bxd5 offered better chances since the white queen was out of play. Mired in time pressure, the Zambian played 47…Ba6?? and Sokolov turned the tables with 48.d6! Solomon played Grischuk in the 1st round and contemplated the best strategy for scaling such a huge obstacle. 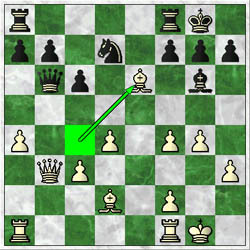 In the 1st game, Solomon played energetically and entered complications after 18.Bxe6?! hoping for 18…fxe6 19.Qxe6+ Rf7 20.f5. 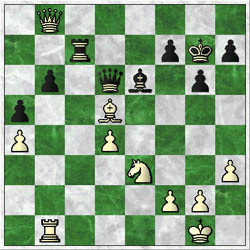 However, the Russian played 18…Bd3! and the knight on d7 cannot be taken. So after 19.Qxb6 Nxb6, white had to lose an exchange and eventually the game (see game). Despite the loss, Solomon held Grischuk in the second game, a magnificent feat for the young South African playing his first super-GM. The future appears bright for Africa and this tournament may inspire more African players to compete on the world stage. With the chess world producing more talent from diverse places, hopefully players of African descent will one day be counted among the world's best.